Few men strike such fear into the heart's of their opponents as the Ritterbrüder do. Even on foot their presence instills fear in the most hardened soldier. 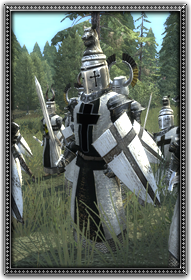 Recognised by their distinct ornate helmets and shields emblazoned with large black crosses, there is no confusing the Ritterbrüder with a combatant of lesser stature. The Teutonic Knights' Headquarters allows the recruitment of veteran Teutonic knights.